Explore an evident guide towhy PMI-ACP® is right for you? Get a quick guide for how to pass PMI-ACP® at the shortest possible time? If you are facing a lofty time to understand what should be the foolproof PMI-ACP® course structure and what support needed throughout my exam preparation? – Well, this introductory course will answer all of your queries. PMI-ACP® is the fastest growing Agile certificate which includes many approaches to agile such as Scrum, Kanban, Lean, XP, and TDD. So this is the most renowned channel to grow you as a versatile Agile Practitioner. Also, doing PMI-ACP® is the perfect evidence of your real-world, hands-on experience and skills in using various agile approaches. Get familiarised to the world of being agile with our free introductory PMI-ACP® program by Saket Bansal. This 7 hours mini-course comes with an excellent opportunity to explore, understand, and clarify your doubts about the PMI-ACP® certificate. What will you get from this PMI-ACP® FREE introductory program? Explore how various Agile approaches can make you a better Agile leader? How can iZenBridge help you to get your PMI-ACP® at the shortest possible time? Have you often heard that there is no PMBOK® kind of book for the ACP® like we have for PMP®? Referring to all of these 12 reference books is tough. Well, we made exam preparation simple by arranging a complete course which is logically organized and has everything to pass the exam in the first attempt. This introductory course will answer your queries to move you in the best direction of getting your PMI-ACP® dream. Snap your introduction to Agile World by merely clicking on the enroll button, and you will be taken to eLearning portal of iZenbridge. Create your account to begin your learning. You need to provide the course name which is available in PDU claim section of your PMI-ACP® introductory course. As soon as you will fill the name, of course, the other details like course provider, course description, and PDU details will be available from the PMI system automatically. You don’t need to enter these details manually. Can I use these PDUs while filling the PMI Application? 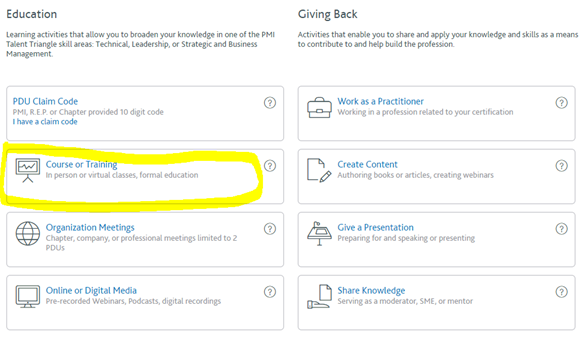 No, for the PMI exam application, you need to report PDUs which are earned alignment of the exam content outline. These PDU’s can be used only to renew your existing PMI certificate. For PMI application, you need to enroll in the course which is specifically designed, and approved for particular PMI certificate. We have complete courses for PMP®, PMI-ACP®, and PMI-PBA® which are approved for required PDus from the PMI.